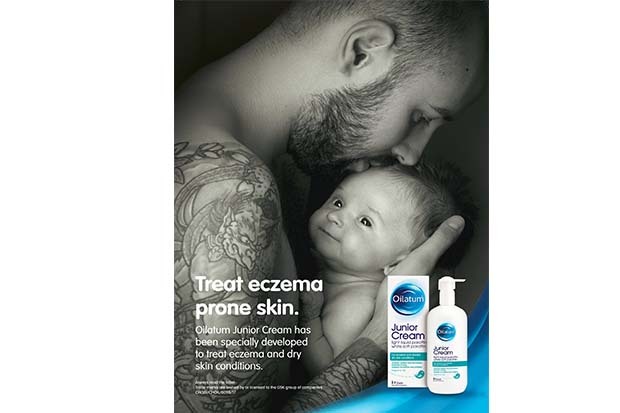 GlaxoSmithKline (GSK) is using an image of a father and son in an advertising campaign to reflect the “protective” qualities of its Oilatum Junior eczema products. The image of a “protective” father “draws parallels with Oilatum, which protects a child’s eczema-prone skin from day one”, GSK claimed. The picture – published in January as part of a wider advertising campaign – will help to inform patients “that Oilatum is gentle enough to use from the very first touch”, the manufacturer added. As part of the marketing campaign, GSK has also partnered with Amazon and NetDoctor to produce branded articles, videos and social media “focusing on first-time mums”. The Oilatum Junior range includes a cream and a bath additive, which both contain light liquid paraffin and can treat contact dermatitis, atopic eczema, senile pruritus, ichthyosis and related dry skin conditions, the manufacturer said. One 150g tube of Oilatum Junior Cream retails at £5.49 and one 150ml bottle of Oilatum Junior Bath Additive costs £5.09. Can you help this patient with his red and flaking skin? How often do patients ask you about eczema?